For the New York weathercaster, see Carol Reed (weather broadcaster). 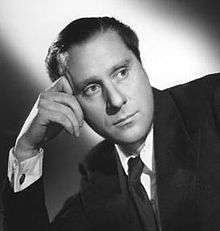 Sir Carol Reed (30 December 1906 – 25 April 1976) was an English film director best known for Odd Man Out (1947), The Fallen Idol (1948) and The Third Man (1949). For Oliver! (1968), he received the Academy Award for Best Director. Carol Reed was born in Putney, south-west London. He was the out-of-wedlock son of actor-producer Sir Herbert Beerbohm Tree and his mistress, May Pinney Reed. He was educated at The King's School, Canterbury. He embarked on an acting career while still in his late teens. A period in the theatrical company of the thriller writer Edgar Wallace followed, and Reed became his personal assistant in 1927. Apart from acting in a few Wallace derived films himself, Reed became involved in adapting his work for the screen during the day while he was a stage manager in the evenings. The connection with Wallace ended with his death in Hollywood during February 1932. Taken on by Basil Dean, Reed worked for his Associated Talking Pictures, successively for ATP as a dialogue director, second-unit director and then assistant director. His films in the later role working under Dean were Autumn Crocus, Lorna Doone and Loyalties and (with Thorold Dickinson) Java Head. His earliest films as director were 'quota quickies'. Of his experience making Midshipman Easy (1935) his first solo directorial project he was harsh on himself. "I was indefinite and indecisive", he said later. "I thought I had picked up a lot about cutting and camera angles, but now, when I had to make all the decisions myself and was not just mentally approving or criticising what somebody else decided, I was pretty much lost. Fortunately, I realised that this was the only way to learn – by making mistakes." Graham Greene, then reviewing films for The Spectator, was much more forgiving, commenting that Reed "has more sense of the cinema than most veteran British directors". Of Reed's comedy Laburnum Grove (1936), he wrote: "Here at last is an English film one can unreservedly praise". He was perceptive about Reed's potential, describing the film as "thoroughly workmanlike and unpretentious, with just the hint of a personal manner which makes one believe that Mr. Reed, when he gets the right script, will prove far more than efficient." Reed's career began to develop with The Stars Look Down (1940), from the A. J. Cronin novel, which features Michael Redgrave in the lead role. Greene wrote that Reed "has at last had his chance and magnificently taken it." He observed that "one forgets the casting altogether: he [Reed] handles his players like a master, so that one remembers them only as people." The scripts of several of Reed's films in this period were written by Frank Launder and Sidney Gilliat, with the screenwriters and director working for producer Edward Black, who released through the British subsidiary of 20th Century Fox. The best known of these films are probably Night Train to Munich (1940), with Rex Harrison; Kipps (1941), again with Michael Redgrave; and The Young Mr Pitt (1942), with Robert Donat in the title role. The later film, although historically inaccurate, is set during the French Revolutionary and Napoleonic Wars. From 1942, Reed served in the Royal Army Ordnance Corps: he was granted the rank of Captain and placed with the film unit, and then with the Directorate of Army Psychiatry. For the latter body a training film, The New Lot (1943),was made, recounting the experiences of five new recruits. It had a script by Eric Ambler and Peter Ustinov, with contributions from Reed, and was produced by Thorold Dickinson. It was remade as The Way Ahead (1944). Reed made his three most highly regarded films just after the war, beginning with Odd Man Out (1947), with James Mason in the lead. It is the tale of an injured terrorist's last hours in an unidentified Northern Irish city. In fact, Belfast was used for the location work, but it remains unnamed in the film. It was the producer Alexander Korda, to whom Reed was now signed, who introduced the director to the novelist Graham Greene. The next two films were made from screenplays by Greene: The Fallen Idol (1948) and The Third Man (1949). The Third Man was co-produced by David O. Selznick and Korda, with the American actors Orson Welles and Joseph Cotten in two of the leading roles. Reed insisted on casting Welles as Harry Lime, although Selznick had wanted Noël Coward for the role. The film required six weeks of location work in Vienna, during which time it was Reed himself who accidentally discovered the zither player Anton Karas, responsible for the film's music, in a courtyard outside a small Viennese restaurant. Reed once said: "A picture should end as it has to. I don’t think anything in life ends 'right'". While Greene wanted Holly Martins (Cotten) and Anna Schmidt (Alida Valli) to reconcile at the end of the film, after Lime, her lover, is killed by Martins, Reed insisted that Anna should ignore him and walk on. "The whole point of the Valli character in that film is that she’d experienced a fatal love – and then comes along this silly American!" According to the film critic Derek Malcolm, The Third Man is the "best film noir ever made out of Britain". The film won the Grand Prix at the Cannes Film Festival, the predecessor of the Palme d'Or. Outcast of the Islands (1952), based on a novel by Joseph Conrad, is often thought to mark the start of his creative decline. The Man Between (1953) is dismissed as a rehash of The Third Man. It "makes no startling impact, such as we have learned to expect from its director, on either the mind or the heart", complained Virginia Graham in The Spectator. While the fable A Kid for Two Farthings (1955), set in the East End of London, has been claimed as one of very few authentic cinematic depictions of an Anglo-Jewish community, it suffers from the stereotyping of Jews and is no more than a "whimsical curiosity" according to Michael Brooke. It was the last film Reed made for Korda's London Films; the producer died at the beginning of 1956. Trapeze (1956), although largely shot in Paris, was made for the US Hecht-Hill-Lancaster Productions company and was a success at the box-office. Our Man in Havana (1959) reunited him with Graham Greene who adapted his own novel. He was contracted to direct a remake of Mutiny on the Bounty (1962) by MGM, but then Marlon Brando was cast as Fletcher Christian, and problems with the mock Bounty and the weather at the locations caused delays. Brando had insisted on creative control, and the two men argued incessantly. Reed left the production at a relatively early stage of production and was replaced by Lewis Milestone. The Agony and the Ecstasy (1965), made in the United States, was a box-office failure, and was the last film over which Reed also served as producer. Oliver! (1968), made at Shepperton in Surrey, was financially backed by Columbia, and won the Academy Award for Best Director. "The movie may have been over-produced but it seemed everyone liked it that way", writes Thomas Hischak. From 1943 until 1947, he was married to the British actress Diana Wynyard. After their divorce, he married, in 1948, the actress Penelope Dudley-Ward, also known as Pempie, the elder daughter of Freda Dudley Ward, who had been a mistress of the Duke of Windsor (Edward VIII) when he was Prince of Wales. They had one son, Max. His stepdaughter Tracy Reed, Ward's daughter, also had an acting career. Actor Oliver Reed was his nephew. In 1953, he became only the second British film director to be knighted for his craft. The first was Sir Alexander Korda in 1942, who was the producer of some of Reed's most admired films. Reed died from a heart attack on 25 April 1976 at his home at 213 King's Road, Chelsea, aged 69. He had lived there since 1948. He is buried in Kensington Cemetery, Gunnersbury, West London, and there is a blue plaque on his former home in his honour. We Serve Recruiting film produced by Verity Films for the ATS. 1 2 Malcolm, Derek (16 March 2000). "Carol Reed: The Third Man". The Guardian. Carol Reed directed films for 40 years, but his golden period was brief. It covered three years in the late '40s when he made Odd Man Out, The Fallen Idol and The Third Man. These three films alone put him in the forefront of British directors of the period, and the last-named, his second collaboration with Graham Greene, is probably the best film noir ever made out of Britain. 1 2 Philip Kemp "Reed, Carol (1906-1976)", Reference Guide to British and Irish Film Director, reprinted at BFI Screenonline. The Oxford Dictionary of National Biography has Wandsworth, London as Reed's place of birth. ↑ "The Stars Look Down - Movie info: cast, reviews, trailer on". Mubi.com. 1999-02-22. Retrieved 2012-06-13. 1 2 Freehan, Deirdre (15 December 2010). "Carol Reed". Senses of Cinema. ↑ Spicer, Andrew (2006). Sydney Box. British Film Makers. Manchester University Press. pp. 24–25. ISBN 978-0-7190-5999-5. Retrieved 13 April 2012. ↑ "6th Moscow International Film Festival (1969)". MIFF. Archived from the original on 16 January 2013. Retrieved 2012-12-17. ↑ "Carol Reed, Filmography". Internet Movie Database. Retrieved 7 July 2009. ↑ "Carol Reed, Awards". Internet Movie Database. Retrieved 7 July 2009.